Olavi Hänninen for HMN Huonekalu Mikko Nupponrn Lahti, 'Bumerang' sofa, light grey fabric and mahogany, Finland, 1960s. This set of armchairs in solid mahogany is designed by the finnish designer and interior architect Olavi Hänninen for HMN Huonekalu Mikko Nupponrn Lahti. 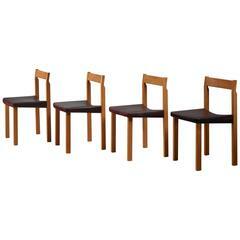 This set by Hänninen features crossed legs on each side, a slatted open back and an overall simplistic, modest design. The pillows are now executed in a white toned fabric. 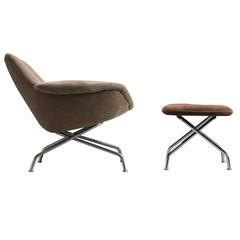 The pieces lean slightly backwards and create a dynamic look whilst at the same time create wonderful sitting comfort. Literature: - Muovituolista raitiovaunuun, Olavi Hänninen – sisustusarkkitehti 1920-1992, Multikustannus 2006. Page 51. If you wish to reupholster this set, please do not hesitate to ask one of our advisors for more information. We have our own in-house experienced upholstery atelier that can accommodate any of your wishes, from leather, fabric to COM. 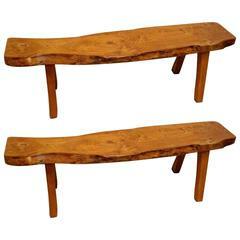 Pair of bench by Olavi Hanninen. Made of elm. Sculptural side chairs designed by Olavi Hanninen and manufactured by Mikko Nupponen, Finland, 1950, made of stained elmwood, handmade, sandblasted really comfortable. First edition finish pair of benches by Olavi Hänninen and edited by Mikko Nupponen in 1958. Elm wood bench by Olavi Hanninen for Mikko Nupponen. Made in Finland 1950s.